The newly renovated Pechanga Resort & Casino has the largest day spa in California’s Temecula Valley. 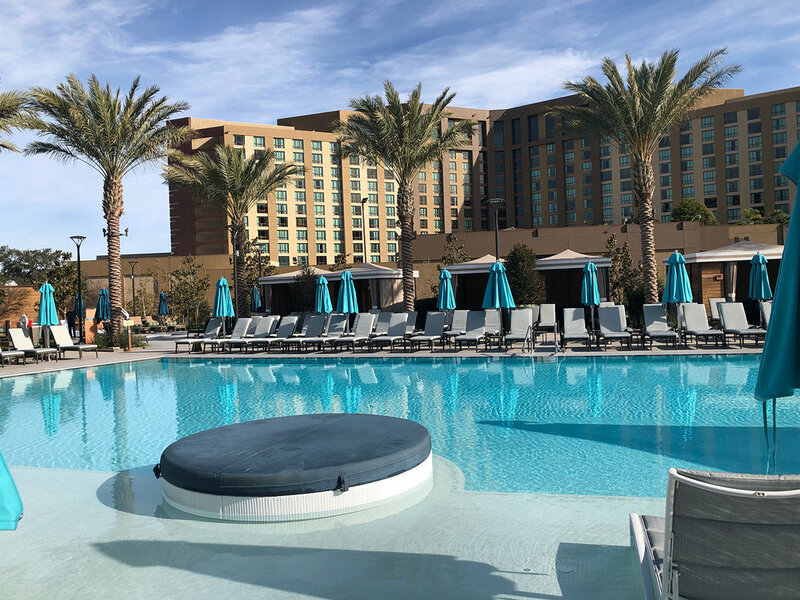 Four Diamond property Pechanga Resort & Casino completed its $300 million expansion to double its size in March 2018, which included the addition of a 568-room Resort Tower, a fourth-floor green roof, a 4 1/2 acre resort-style pool complex, as well as a 25,000 square-foot, two-story luxury Spa. 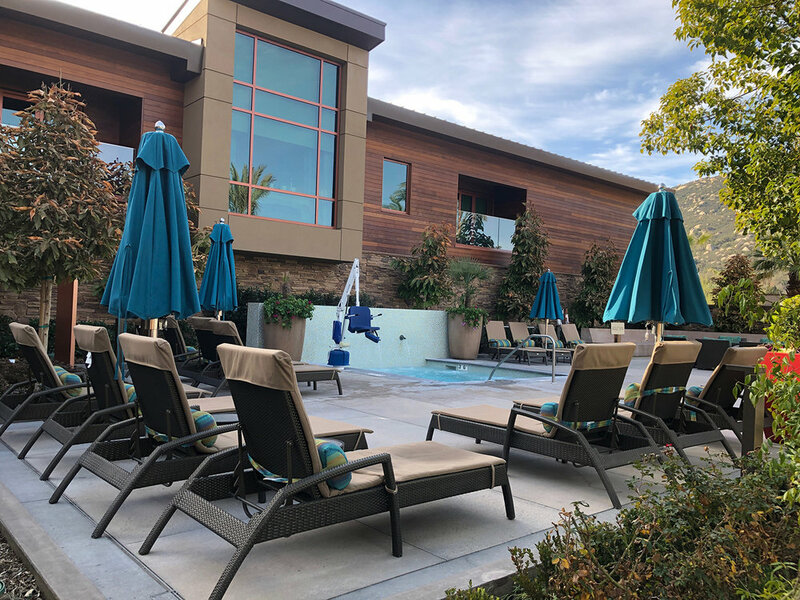 Recently, my husband Eric accompanied me for a highly-anticipated weekend of wellness at the newly renovated resort, which is located in Temecula, California. A picturesque city with expansive hillside vineyards and golf courses, Temecula is a popular destination for bridal parties, bachelorettes, family outings, and more—and with the addition of the updated resort with multiple restaurants, a pool complex and casino—it has even more to offer in the way of entertainment and attractions for locals and out-of-towners alike. After we checked-in at the front desk, it was time to head over to the spa for our first activity of the weekend: a private yoga class. As I walked up the steps leading to the two-story spa, I was beyond impressed. Spacious, immaculate and modern, Spa Pechanga has a state-of-the-art fitness center that includes Peloton bikes, in addition to 17 luxurious treatment rooms, a full-service hair and nail salon, and a retail area that sells many popular skin care brands such as Eminence Organic Skin Care, Kopari Beauty, Pure Fiji, and more. Spa Pechanga is the resort’s stunning 25,000 square-foot spa. The Spa’s retail area sells a variety of great skin care and beauty brands, including fun items like this cute T-shirt that is perfect for any spa lover. We met with Mimi Ko, the resort’s fitness coordinator, yoga and circuit training instructor, who asked us what we were looking to get out of the morning yoga session. 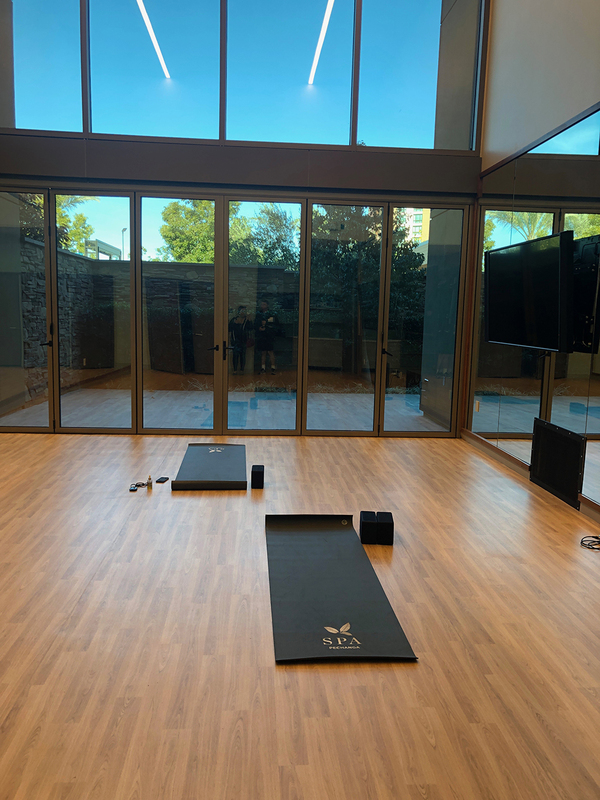 After informing her that we wanted a relaxing workout that would stretch our tight muscles, she proceeded to lead us through a series of customized yoga moves while sharing insight into the Spa’s fitness and wellness offerings. Yoga classes are offered five days a week, at 10 a.m. every day from Wednesday through Sunday. Classes are complimentary to all hotel guests and guests who have purchased a spa treatment. Non-hotel guests are welcome to purchase class packages or drop-ins. Private classes or individual sessions can be scheduled through the Spa Concierge. The Spa’s fitness facility includes a state-of-the-art gym, studio and outdoor patio. Next it was time for our spa appointments. We had about half an hour before our actual services started, which gave us time to explore and enjoy the facilities. One of the Spa’s unique features is the beautiful artwork located throughout that has been created by Native American artists from the Pechanga Band of Luiseno Mission Indians, the owners of Spa Pechanga—as the Spa sits on the Tribe’s reservation. The hallway leading from the reception desk to the Spa. 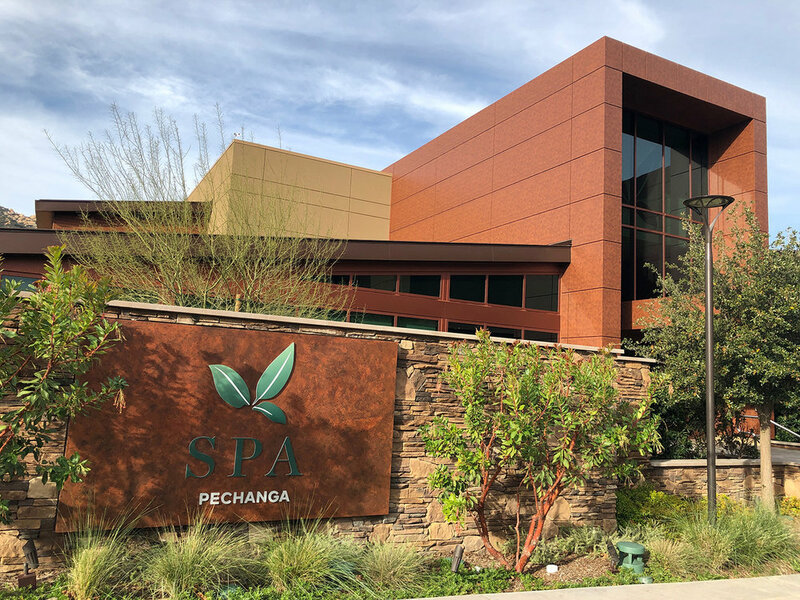 Spa Pechanga is inspired by the reverence for native botanicals and the strength of the Great Oak known as Wi’aasal. Eric and I were each given individual tours of the men’s and women’s lounges, which have their own showers, dry grooming areas, steam rooms, saunas, and private pools. Lockers are generously stocked with a bath robe, slippers, bottled water, and shower spa mist. The generously stocked lockers in the Spa. The Spa lounge includes an upper outside deck that offers views of the golf course and Pu’eska Mountain. After spending time in the steam room and whirlpool, I headed to the co-ed lounge to meet up with Eric before our spa treatments. The spacious indoor lounge offers infused water, teas, fresh berries, and complimentary exclusive treats inspired by native and local ingredients. I tried the Chia Páasal Blueberry Muffins, which tasted delicious—the Páasal is said to help repair the body, supply omega 3 fatty acids, lower blood pressure, and promote a healthy heart and strong bones. In that case, I’ll have another serving! After filling up on healthy snacks, we took a seat on the outdoor wellness patio, which offers unobstructed views of the golf course and mountains. Spa guests also have access to a private outdoor Jacuzzi, pool and cabanas, making it the ultimate sanctuary for relaxation. The Spa has a private swimming pool and jacuzzi area for guests to enjoy. Private cabanas are also available next to the Spa pool. After lounging in the lap of luxury, we were both called to our separate treatment rooms. 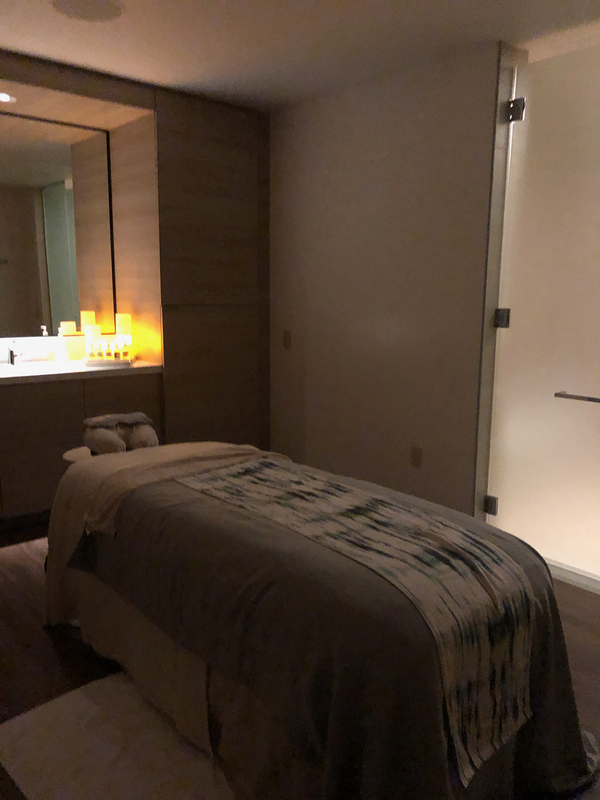 Eric received a 50-minute Pechanga Traditional Massage, which focuses on promoting relaxation with gentle, long strokes as the therapist focuses on areas that require the most attention, improving circulation and relieving stress. I enjoyed the Acorn & Walnut Renewal, an 80-minute treatment that nourishes and refines skin utilizing the Spa’s exclusively blended walnut and acorn scrub, which increases circulation and promotes physical and spiritual well-being. After the exfoliation, I rinsed off in my suite’s private shower, followed by a custom pressure full-body massage accompanied by soothing lavender and sage aromatherapy, as well as a warm argan and kukui nut oil hair and scalp massage. The spa menu, which integrates the healing power of Native American botanicals (it’s also the largest day spa in Temecula Valley! ), offers a variety of unique and restorative treatments, among them the Waves of Sound Massage (which takes place in a zero-gravity relaxation chair), Prickly Pear Body Polish treatment, and the Healing Honey Massage (which infuses propolis into the dermis along with a hydrating milk and honey facial mask). The Salon also provides hairstyling, barber services, and manis and pedis, so that all guests’ beauty needs will be met. With so many amazing treatments on offer, I already began planning my next visit! The Spa treatment room includes its own private shower. After our relaxing spa session we had some free time before dinner, so we headed up to our room in the brand-new Resort Tower. The Deluxe rooms in this tower feature top-of-the-line amenities including bath products, Keurig coffee makers, and the latest technology inputs, and offer up to 400 square feet of relaxation on another level. Our Deluxe King Room included a beautiful bathroom with his and hers sinks, a spacious and modern shower, luxurious amenities, and a separate toilet area. A swan folded out of towels greeted me as I stepped in to take my shower before dinner, which was a nice touch! The Resort Tower also has stunning Corner Suites featuring floor-to-ceiling windows with amazing views of the golf course and Temecula Hills, as well as Spa Studios, which include an oversized spa tub for two and glass encased shower. Definitely worth the upgrade! A beautifully folded towel swan awaited in shower of our room at the resort. After relaxing in our room and enjoying the bath amenities, we headed down for our dinner reservation at the Lobby Bar & Grill, which is the Resort’s newest dining option and has a soothing ambiance that includes a sunset motif on the wall. Helmed by Chef Jose Mendoza, the menu features locally sourced ingredients that are blended together into a flavorful fusion of American, Mexican and Asian-inspired fare. The Lobby Bar & Grill serves breakfast, lunch and dinner, and menu includes a variety of tasty and innovative dishes, including stuffed bone marrow toast, seared scallops, crispy Brussels sprouts served with apple glaze and Asiago cheese, and many more. After dinner we headed to the busy casino for some after-hours fun, which has everything from slot machines and tables games to off-track betting. It was easy to forget that I was in Temecula and not Las Vegas. A beautiful sunset motif is part of the decor at the Resort’s Lobby Bar & Grill. After a restful night’s sleep, we headed to Journey’s End for breakfast. The restaurant, which is officially my favorite at Pechanga, serves breakfast, lunch, happy hour and a sunset menu, alongside gorgeous views of the premier golf course and surrounding Temecula Valley. It has both indoor and outdoor dining options, and has a fireplace and outdoor fire pit as well. Journey’s End serves breakfast, lunch, and a sunset menu. The restaurant offers breathtaking views of Pechanga’s premier golf course and the surrounding Temecula Valley. For those interested in playing some golf while at the Resort, Journey at Pechanga is the par-72, links-style award-winning course designed by noted architects Arthur Hills and Steve Forrest. The course is a sight to behold, offering stunning views of the Temecula Wine Country and the surrounding rolling hills, making it the perfect place to spend a morning, afternoon—or an entire day. Journey’s End has several outdoor decks with expansive views. Next, we ventured to The Cove—the Resort’s 4.5-acre tropical oasis. In addition to three pools, it has a zero-edge Main Pool with a swim-up bar, Family Pool with two waterslides, a splash pad and five spas. There’s also a grassy area for parties and small gatherings, 27 cabanas, and six day beds, making it the perfect spot for daytime fun, large groups, parties, and more. The Cove is the Resort’s 4.5-acre tropical oasis. The Cove has three swimming pools, making it the perfect place to relax during a hot day. The zero-edge Main Pool with a swim-up bar at The Cove. The Cove also has 27 cabanas and six daybeds for guests to enjoy. The Cove also has a Family Pool with two waterslides, a splash pad, and five spas. Those spending the day at The Cove have the option of ordering food and drink poolside, or dining at The Coveside Grill, which serves a variety of warm-weather treats including homemade ice cream sandwiches, frozen grapes in champagne (and Sprite for kids), along with salads, sandwiches, and more. The Pool Bar & Grill also serves up inventive craft cocktails prepared by the Resort’s mixologists, who concoct tasty daiquiris, margaritas, mai tais, martinis, and everything in-between. We enjoyed our time under the sun for the next few hours, listening to blissful dance tunes played on the speakers by the main pool as we sipped on crafty cocktails before looking at our watches and realizing that sadly, it was time to head back home. 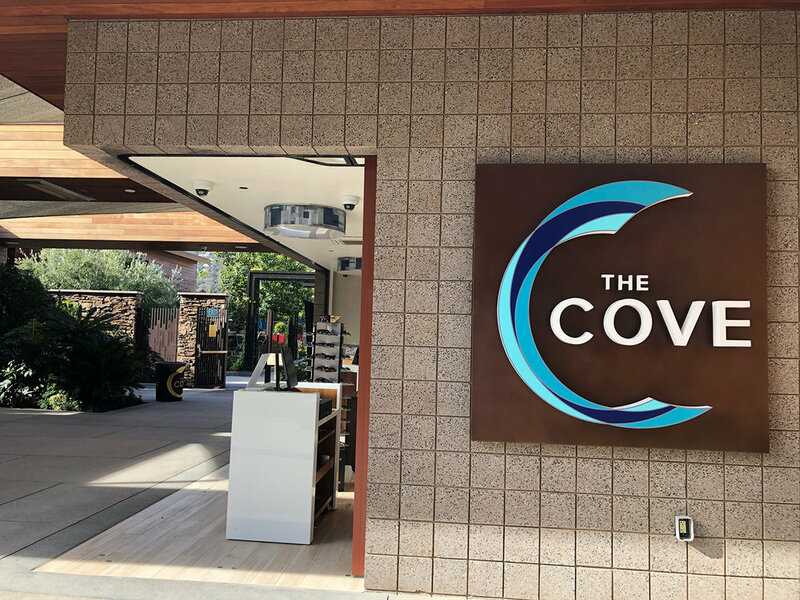 Guests at The Cove can also order food and cocktails at The Coveside Grill. However, one last stop awaited us before our departure: a visit to the Resort’s fourth-floor rooftop garden, Zen space and event lawn, which is strategically designed with the capacity to host concerts, mixed martial arts and boxing matches, or even a wedding venue. The garden includes a variety of sustainable plant materials that are drought-tolerant, creating an energy-efficient, health landscape that guests can enjoy regardless of local weather conditions. This is another aspect of Pechanga Resort that I thoroughly appreciate—its respect towards nature and the deep thought that was put into every detail, such as the preservation and relocation of the property’s oak trees, which are sacred to the Pechanga people and have provided sustenance to the tribe for hundreds of years. As we packed our belongings into the car and began the drive home, I rejoiced in the fact that this wouldn’t be the last I would see of Pechanga Resort. Less than a two-hour drive from Los Angeles, it makes for the perfect weekend destination—be it a girls’ outing, romantic getaway, or simply an opportunity to unplug from the daily grind and indulge in some much-needed rest and relaxation. Pechanga Resort also has a fourth floor green roof. Arrive 40 minutes early to enjoy the spa’s amenities pre- and post-treatment. Don’t forget to bring a swimsuit for the Spa’s hydrotherapy facilities. Spa Pechanga is open Monday - Sunday and holidays from 7:30 a.m. - 8 p.m.